Hologate, the Germany-based virtual reality manufacturer, will run a tournament in one of its latest games, Groove Guardians. In the game, which has been available to purchase since before Christmas, players use their controllers to hit oncoming musical notes in time to the music. They must come together in teams of four to be able to reach the high score. As the game is connected to the internet, the tournament will take place in over 200 sites. “When we have our finalists we will bring all them all together in a really cool location and have them play each other there,” said Leif Petersen, founder and CEO of Hologate. An exact date for the tournament hasn’t been announced yet, but Petersen believes it will take place during the summer. It is still early days so Petersen wasn’t able to divulge how much prize money the finalists will receive or who the event sponsors will be. The announcement is the latest in a string of esports style tournaments, which many predict will become a strong trend within a few years. It will be a busy year for the company. As well as the tournament, it will have its World of Tanks game and Das Boot VR escape room coming out in Q1 and its Angry Birds game hitting the scene during the summer. 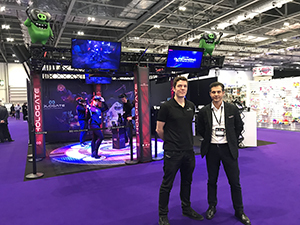 In attendance at EAG last week in London, UK, the company showcased Grove Guardians as well as Zombyte, its new zombie shooter game. Pictured: Leif Petersen, Hologate CEO and founder with the company's chief business development officer, Kubilay Tok.